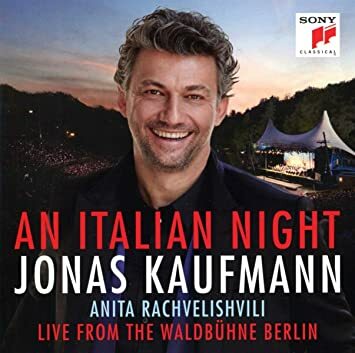 Jonas Kaufmann "A [Live] Italian Night"
Like many others, I have found much to enjoy in the voice of Jonas Kaufmann, tenor. This CD was recorded live at the Waldbühne in Berlin, Germany. 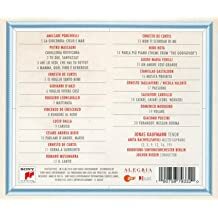 His guest singer is the highly-touted mezzo-soprano, Anita Rachvelishvili in six selections on the disc. Hearing her here made me seek out her own excellent CD for Sony Classical in an all-opera program CD . We all know Kaufmann has had some vocal problems and apparently is on the road to good reviews and success again, thankfully. Frankly, I was not totally satisfied with this release even though it contains many favourite Italian songs, especially one of my very favourites: "Non ti Scordar di me." The voice is "pinched" on the high end and is "throaty" throughout.The concert was recorded live on July 13, 2018. No, it isn't "awful" by any stroke of imagination, but it isn't the Kaufmann voice that attracted me to his art in the first place. Obviously, the audience loves it, especially "Nessun dorma," which always bring the house down by any singer as it closes the program; and by their applause in Germany, anything Kaufmann does is great. 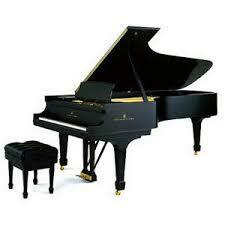 Orchestral support comes from the Berlin Radio Symphony Orchestra under Jochen Rieder, who gives exceptional support. Do any other CMGers have this CD and if so, how do you rate it? Re: Jonas Kaufmann "A [Live] Italian Night"
I must say that his over-use of softer tones on his high notes sometimes worries me, as it can put a strain on his technique. Found this on Kaufmann, probably more information around. Kaufmann has disappointed me so much and so often lately that I completely stopped going to his performance. For instance, I have skipped both his recent Carnegie Hall recital and La fanciulla, which would have unthinkable 7-8 years ago. On the other hand, I love Anita Rachvelishvili, bought her CD the day it came out and listened to it many times already. Her Amneris at the Met was absolutely fantastic, one of the very best I have ever heard, totally eclipsing the subpar singing of everybody else on stage that night. What did you think of her debut solo CD, Lance? I absolutely am absolutely taken with Rachvelishvili's voice. It has none of the characteristics of vocalists from the Russian region that I have heard so much years ago. The good thing about the Kaufmann disc of the Italian live recital is that where she participates with him in duets, they both do very well together. I hope she records much more. Thanks to both of you for the information on Kaufmann and Rachvelishvili. By her name, I would say that she is from Georgia Republic, rather than from Russia itself. Anyway, I have put her CD in my cart for next month. I am absolutely taken with Rachvelishvili's voice. It has none of the characteristics of vocalists from the Russian region that I have heard so much years ago. The good thing about the Kaufmann disc of the Italian live recital is that where she participates with him in duets, they both do very well together. I hope she records much more.